Annan Athletic grabbed what could prove to be a precious league point against recently demoted Stenhousemuir in a match which was by no means a classic match but Annan displayed a resilient side to their play after losing an early 7th minute goal to bounce back and grab a deserved share of the points. Manager Peter Murphy started with the same team which brought Elgin City’s proud unbeaten home record to an end the previous week. Included in the squad was recent signing ex Raith Rovers player Scott Roberts who made his home debut coming off the bench for Dan Orsi in the second half. 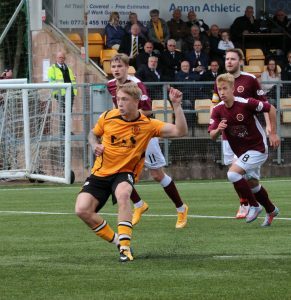 Stenhousemuir started the game positively against an Annan team who started slowly giving the visitors the initiative as they took the game to Annan. The visitors were rewarded in the 7th minute when Stenhousemuir went ahead. It was a simple goal in the making which unlocked the Annan defence after Dunlop’s long high ball played over the top caught the Annan defence on the turn and the ball was perfectly weighted for Mark McGuigan who homed in on keeper Jim Atkinson to finish with a well placed clinical shot past the Annan keeper. The visitors built on this early success without really testing the Annan defence, Martin Scott had an opportunity when he headed straight into the arms of Jim Atkinson knowing he squandered a goal scoring opportunity. Peter Watson conceded a free kick 20 yards out centre of the goal and Atkinson pulled off an important save to deny Ruaridh Donaldson. Steven Swinglehurst then headed narrowly past from a Brandon Luke cross to the back post as Annan started to test the Stenhousemuir defence. Rabin Omar came close in the 35th minute, this was followed by a penetrating Owen Moxon run who finished with a low curling shot which flashed past the post. Stenhousemuir were being tested for the first time in the match but Annan were finding it difficult to penetrate the well organised defence. At the start of the second half the visitors were presented with a glorious opportunity in the 52nd minute when Ryan Sinnamon was forced into a difficult position in the corner of the park and Mark McGuigan dispossessed the Annan player to finish with a curling low shot which struck the upright. The dangerous McGuigan followed this up with a low shot from the edge of the box which went narrowly past. Sinnamon tried his luck with a low 25 yarder which keeper Chris Smith confidently saved as Annn started to impose their authority on the game. Annan won a penalty kick in the 69th minute when McGuigan turned sinner with a clumsy challenge climbing over Swinglehurst, Aiden Smith stepped up to send the spot kick into the corner of the net to square the game. Annan continued to press forward Rabin Omar’s dangerous cross to the back post was punched to safety by keeper Chris Smith. As the game entered the final period Annan keeper Jim Atkinson came to his sides rescue with an important save to deny Ross Dunlop. The visitors were then denied by another important save by Atkinsons feet as his last ditch tackle denied Stenhousemuir a late winner. In the end a draw was possibly the right result with neither team doing enough to win the match in a game of 2 halves. It was a day in the SPFL2 where Stirling Albion consolidated their position at the top of the league with a 2-1 victory over Montrose. Berwick came back from 2 goals down to score 2 late goals to defeat Elgin City 3-2 , The Bookies favourites for the title Peterhead maintained their challenge at the top with a convincing 4-0 victory over Cowdenbeath who remain at the foot of the table. Edinburgh City lifted the points at the expense of Clyde courtesy of an injury time winner from Craig Beatie to secure a 3-2 victory. Annan Athletic – Jim Atkinson, Scott Hooper,Jack Brannan, Owen Moxon, Peter Watson, Steven Swinglehurst, Dan Orsi ( Scott Roberts HT) , Ryan Sinnamon, Aiden Smith ( John Cunningham 89 min), Rabine Omar, Brandon Luke (Blair Henderson 65 min). Substitutes not used Alex Mitchell (gk), Ellis Pearson, Peter Murphy, James Creaney. STENHOUSEMUIR Chris Smith, Ross Meechan, Michael Dunlop, Ross Dunlop, Nathen Blockley ( Eddie Ferns 60 min), Mark Ferry, Mark McGuigan, Harry Paten, Jamie Longworth ( Colin McMenamin 71 min) , Martin Scott (Innes Murray 67 min ). Substitutes not used: David Marsh, Ross Gimour, Lewis McMinn, Nickie Paterson. Annans next match is at Forthbank against Stirling Albion next Saturday.